Not recommended for costumes, see description. 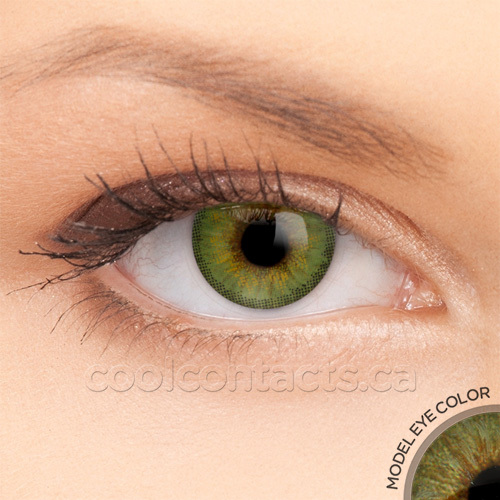 These lenses are designed to change your eye colour in a subtle and realistic way. View all 4 product images to see how they'll look on your eye colour. For costume lenses, view our Halloween Contacts. All contact lenses come in pairs. A quantity of 1 includes two lenses. Our 3 Tone Light Green Contact Lenses are part of our natural line of contact lenses. These natural contact lenses use a combination of beautiful colouring and translucence to subtly blend in with your original iris, giving you a striking and unique natural look. Consult the images below to see how these lenses would look on your eye colour. Sold in Pairs (2 eye accessories). Etafilcon A (58% water - 42% Hema). Immersed in buffered isotonic saline. "COOLCONTACTS NATURAL & SPECIAL FX CONTACT LENSES" are Class II Medical Devices in Canada. Our customers' safety is our top priority. COOLCONTACTS brand contact lenses are certified according to the ISO 13485:2003 certification standard recognized by the Canadian Medical Device Conformity Assessment System (CMDCAS) and classified as Class II Medical Devices by Health Canada. Wearing COOLCONTACTS brand contact lenses is no different than wearing regular prescription contacts approved by Health Canada. Our lenses have been individually photographed over real eyes to accurately display their effect (we superimposed the results over the same model for easier comparison). You can shop confidently knowing whether the lenses will achieve the look you're going for. Each pair of lenses comes with a free lens case! All orders ship from our warehouse in Ottawa, ON. Orders get shipped every workday at 4PM EST. Our customers love our lenses! Browse all of our lenses and view customer-submitted reviews and photos of themselves wearing our lenses to top off their awesome costumes. Submit a photo of yourself wearing your sweet lenses by emailing it to us at info@coolcontacts.ca and we might post it to our website and social media! Great quality,I have hazel eye colour (brown/green) these lenses have 3 tones in them,making colour very natural.My eyes became a light brown in center with a bit of yellow and a vibrant green! Very pretty!